Q: How do I get an agent or manager? A: Generally signing with an agent or manager begins with them reading and liking one of your screenplays. Getting your material read depends on how good your query letter/email is, if you win a prominent screenplay competition or are able to get a referral from an industry professional. If you are ever asked to “pay” to submit a script for possible representation, run as fast as you can as that is generally a con job. No legit manager or agent will charge you to submit material. Most however will NOT accept unsolicited screenplays, so be sure to query them first. Q: What is a “query” and how do I do it? A: A query is basically an inquiry on your part, asking if someone would be willing to read your screenplay. It usually contains the logline of the script you’re pitching, maybe a sentence about yourself and whatever other pertinent information you feel might be relevant, such as any awards you may have won. Whatever you do, keep it brief and do not write more than a couple short paragraphs. In addition, your query should only mention a single screenplay you are interested in having them read. You should not include a long list of scripts you’ve written or pitch them a bunch of ideas. It may seem like you’re showing how prolific a writer you are, but in actuality it shows that you have written a lot of material that hasn’t attracted the interest of anyone and that even you can’t pick your best piece of material for submission and so are shotgunning everything you have at them. One strong script is a better calling card than a dozen mediocre pieces. You can query via email or snail mail. Q: What is a “referral”? Do I need one? How can I get one? Q: An agent/manager sent me a release form to sign before reading my screenplay that says I can’t sue them if they steal my idea – do I have to sign it? A: If you want them to read your screenplay you do. Many people think they are the only person in the world who has ever come up with their brilliant idea. This is rarely true. How many movies are, intentionally or otherwise, derivative of other stories, movies, books, articles, etc.? Agents, managers, executives and producers who send out release forms are doing so to generally protecting themselves against frivolous litigation in the event they happen to have a project in development that may be similar to something you are sending to them. While there are cases of intellectual property theft, it is really more of a rarity than commonplace. Be sure to do your due diligence and register your script with the WGA and/or copyright office, but a release form should not deter you from submitting your material to legit producers or representation. Q: How much do scripts sell for? A: The purchase price of screenplays varies wildly. WGA minimum for the purchase of an “original” feature length script is $42,930 (as of 5/2/11). Terry Rossio and Bill Marsilii received $5 million in compensation for the screenplay for Deja Vu, which is currently the highest price ever paid for a screenplay. For non-union writers however, which if you’re reading this you probably fall into that category, the rates are substantially lower and the sale price would be whatever you or your representative are able to negotiate. Q: What kind of software do I need to write a script? A: Technically, you can use any word processing program to write a screenplay. Screenwriting software simply makes it easier, as it basically auto-formats your script for you. If you do choose to use MS Word or another word processing program, pay close attention to your formatting as nothing will turn off a reader faster than a poorly formatted screenplay. 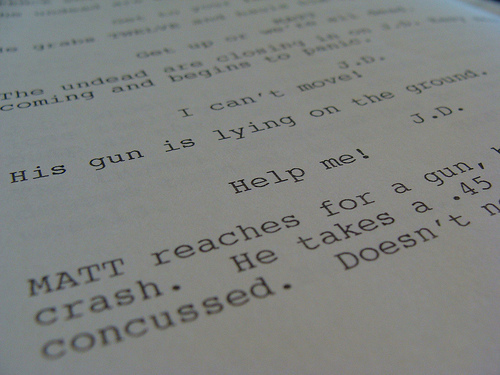 Proper screenplay format can be found HERE. If you are in the market for professional screenwriting software, our personal favorite is Final Draft. It is available on PC and MAC and is very easy to use. It retails for $200-$250 (USD) so it certainly isn’t cheap. But if you have the money and are going to pursue a career as a screenwriter, it is a valuable investment and well worth it in our opinion. Movie Magic Screenwriting is also very highly used screenwriting software by professionals in the industry. I have not personally used it, but I’m sure it is fully capable of doing the job similar to Final Draft. Both programs are widely used within the industry. There is also a FREE program called Celtx that many film students I’ve spoken with really seem to like. If you’re just starting out, you can try this and see if it fits your needs as well. Q: Do I need to live in Hollywood to be a professional screenwriter? A: Short answer, no you don’t. But it certainly helps. Honestly great material is great material. If you have an amazing script and can get it into the right hands, it won’t matter if you live in Timbuktu, you and your screenplay will get noticed. That being said, it’s much simpler to take meetings and network if you live in or near Los Angeles (or even New York City), and that makes the getting your material in the “right hands” a little easier. In addition, many screenplays are written not on spec, but on assignment. That means taking many meetings with producers and executives to pitch ideas and takes in hopes they hire you to write a screenplay. To take these meetings however, writers generally need to be in the Los Angeles area or be able to travel and stay there for a couple weeks at a time at least a few times a year. Q: What kind of script/story is Hollywood looking for? A: Short answer, it varies. What is a hot or original idea to one producer or executive, might be hackneyed or too derivative for another. Writers should focus on writing the best possible screenplay possible, regardless of the subject matter. A strong story, regardless of genre, will stand on its own. That being said, it’s always a good idea for you as a writer to keep up to date on what’s going on in the industry and any recent script sales. Some good resources are The Hollywood Reporter, Variety and Deadline Hollywood. There could be a spec sale of a script with a similar plot to yours which might make it more difficult to get yours read, or there could be a run on horror scripts and it could be perfect timing for you to go out wide with your supernatural masterpiece. A: The average feature film screenplay is about 80-120 pages. Any less than that and it wouldn’t likely fill enough screen time to be considered a full length feature film and if it’s any longer, it is likely to be more than two hours long. Films more than two hours in length generally have fewer showtimes per day in theaters and that equals less revenue for the studio, so executives tend to be wary of that. Teleplays often run about 35-45 pages for a half hour show and 60-75 pages for an hour long program. The rule is generally a minute of screen time per page of script. However, the more dialogue a script has, the longer the page count generally. Q: Have a question you’d like answered?